Oh boy, I need to start running more. Seems I’m starting to slack on my goal. And I was doing so well! I’m at 280.69 miles as of Sunday and we’re 223 (as of Sunday) days into 2013. Good news, I’m ahead of the day count, but bad news that I’m running less than 7 miles a week. Ahhhhh. I need some motivation, especially with two more 5 Ks coming up. Anyone with tips, let me know. I’ve been filling my Pinterest board with inspirational quotes, but I feel like I’m losing steam. On the bright side, I am maintaining my weight and getting toned, so I’m back on the workout wagon. That means more recipes to make, including trying to hide vegetables in everything I create. 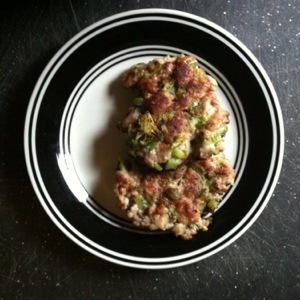 Take the sausage patties I made the other day, somehow some broccoli and green peppers made their way into the mix. I’m not complaining, makes the patties a bit more beefed up. Head a splash of olive oil in a medium-sized pan. 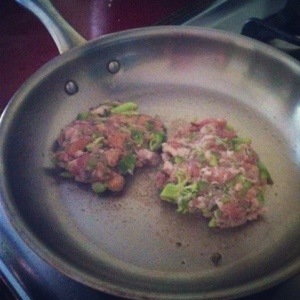 Mix all ingredients (except for olive oil) in a bowl and portion into four patties. Heat on each side until golden brown and cooked through, about 5 minutes a size. Let cool on a paper towel and then serve.